↑ Identifying iPhone models. Support.apple.com (April 8, 2013). Retrieved on July 10, 2013. 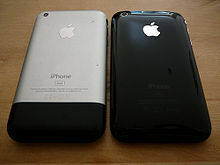 ↑ "Apple Introduces the New iPhone 3G" (Press release).